All artwork, images, text, and data within this shop are protected under U.S. and international copyright and trademark laws. All rights reserved. Copying or redistribution in any manner for commercial use, including commercial publication, or for personal gain is strictly prohibited by penalty of law. TURNAROUND TIME: 5-7 business days. 24 Hour RUSH painting service along with Expedited Shipping services are available upon request. Each train segment contains small parts: wheels, spindles and magnets, therefore Vibrant Trains are not recommended as a play toy for young children who may place small non-edible objects in their mouths. 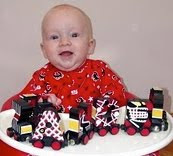 For this reason a chocking hazard warning accompanies each keepsake train created. Vibrant Trains are custom hand painted wooden alphabet name trains designed and painted to meet your design specifications. MATCHING TRAINS are designed and painted to match subject matter of your choosing. Examples: nursery room décor, children’s bedroom décor, favorite stuffed animal or toy, favorite place, etc. THEME TRAINS are designed and painted using your desired theme. Examples: animals, sea life, pets, flowers, nature, organizations, hobbies, group activities, etc. MURAL TRAINS are painted to depict an image that is painted across the entire length of the train. Examples: outdoors scene, cityscape, landscape, places of interest, etc. CHARACTER TRAINS are painted using images of characters derived from movies, cartoons, storybooks, etc. SIGNATURE VT TRAINS include a variety of random free form patterns, stripes, dots, swirls, hearts, flowers, etc. SPORTS TRAINS are designed and painted to include images that are common to the sport desired. Examples: a hockey train may include a stick, puck, team logo, team mascot, net, jersey, etc. LOGO TRAINS are designed to include the logo and graphics that accompany a given subject matter. Examples include: favorite college, club, organizations, groups, troops, etc. THE SKY IS THE LIMIT! If you do not see something listed that you are interested in, no problem! Just let me know what you would like and I will create it for you! Creating custom alphabet name trains for my clients is truly a joy. I feel very privileged and truly blessed to be able to provide my clients with a unique and creative keepsake for their loved ones, while doing something that I truly love. ©2011 VibrantTrains. Picture Window theme. Powered by Blogger.